take to the stage of Cork Opera House on Saturday September 29th and Sunday September 30th following on from sell out shows at Cork Opera House last year, The INEC and The Gleneagle Ballroom in Killarney. Having sold out last year, the show will also play again at Clayton Hotel Silver Springs on Sunday January 6th 2019 for Women’s Little Christmas. Cork has produced many showband legends over the years: the never to be forgotten late Brendan O’Brien and the late Glenn Curtin, along with the recently deceased Steve Lynch of the Dixies and the late Pat Lynch the Airchords who died earlier this year. The legendary Dixie Joe Mac is still going strong and eagerly looking forward to performing at Cork Opera House. Ms. Sandy Kelly, fresh from her recent Cork Opera House show, plus Tony Stevens, Terry McCarthy, formerly of The Dixies, Declan Ryan, formerly of The Regal, Johnny Carroll (The Man with the Golden Trumpet) along with Mary, Derval and Derek Burke of Crystal Swing complete the line-up for the show. Also joining the shows are special guests the legendary Paddy Cole, formerly of the Capitol and Big 8 showbands along with Limerick singing legend Dennis Allen, and Dermot Hegarty of the Plainsmen. A special tribute will be paid to the songs of the late and legendary Airchords star Pat Lynch by the showband show on the night. Tickets €34.50 from the Cork Opera House Box Office 021 4270022. Make sure to book early! 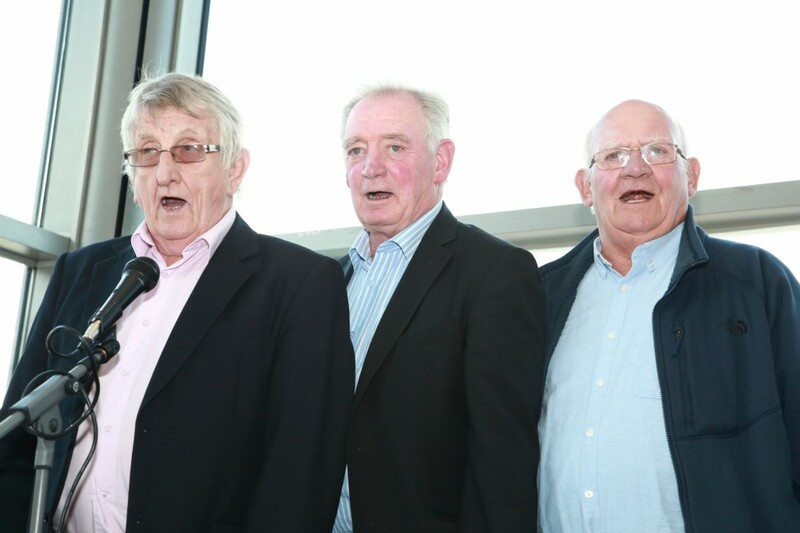 Pictured at the launch are three Cork showband era legends Joe Mac of The Dixies, his brother Terry McCarthy of The Regal, and Sean Kinsella.